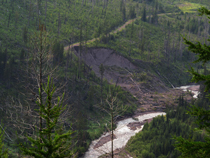 Let the Flathead National Forest know TODAY that you support Alternative C's new wilderness recommendations and prohibiting mechanized vehicles in those 507,000 acres/all roadless lands! But be sure to add that you want the reclamation of grizzly bear habitat security in roaded lands, as promised in the current Forest Plan's Amendment 19, carried forward in Alt. C! The Flathead NF map above shows in light green Alt. 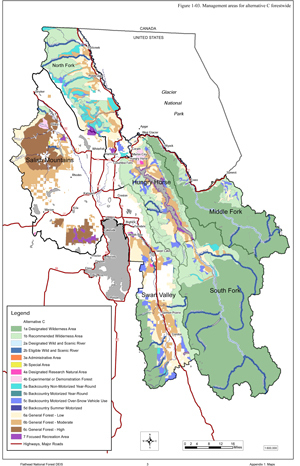 C's recommended wilderness providing habitat connectivity the full length of the Swan Range and improvements thoughout the Whitefish Range, among other areas. In asking the Flathead to adopt and improve Alt. C, know that you will be expanding wildlife habitat security and connectivity greatly, while also conserving quiet, non-mechanized recreation. As mentioned in our last alert, BEWARE the Whitefish Range Partnership Agreement you may be asked to support. It asks for little wilderness and would increase logging in grizzly bear and lynx habitat through a combination of de-listing and relaxed management standards! (WRPA pdf page 28). You can also submit our form letter if you wish, or chose the parts of it you like best. A mailing address is included in the form letter if you wish to mail in a hard copy. Click here for more information and links to the Forest Plan documents. Comments are due TODAY, October 3!